Here we see the noble Fluffy Bunny—species Puffalumpus Urungus—perched atop a wing. 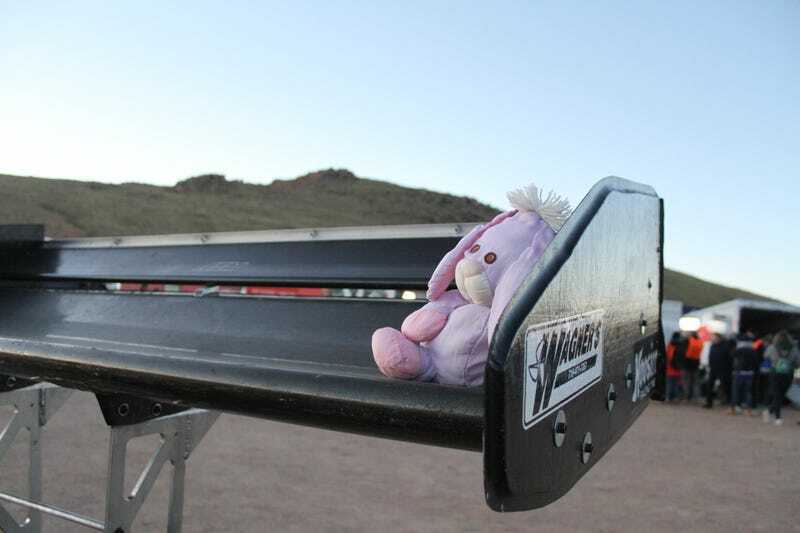 This particular Fluffy Bunny has a wild crown of white yarn upon her head and loves to nest in the wings, ducts and crannies of parked race cars, and sometimes in back seats of track cars. This is a rare close look at one of nature’s most savage creatures. We must maintain a proper distance, as the Fluffy Bunny is known to attack when disturbed prematurely off of a prized large rear wing. Always approach the Fluffy Bunny with EXTREME CAUTION when you see one in the wild.